It’s Day 9 of our 30 Days of Cozy and today’s free crochet pattern is brought to us by Stephanie of Grace and Yarn. I’ve been admiring Stephanie’s work for months now. Her designs are playful, bright, and filled with the whimsy of childhood and this amigurumi seal pup crochet pattern is no different. Any little girl or lover of marine animals would delight to find this lovely stuffed seal under the tree this season and Stephanie adds a sweet, feminine embellishment with a darling little bow. It’s the perfect finishing touch. 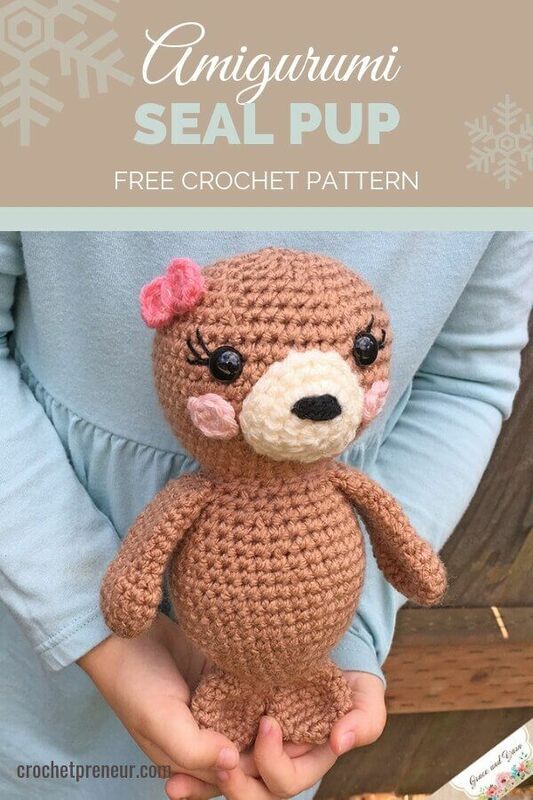 Purchase the ad-free, downloadable PDF of the amigurumi seal pup crochet pattern on Etsy or Ravelry. Gauge is not necessary for this project, your finished seal pup will measure approximately 7 inches tall. We will work the tail, body and head as one piece and will be working in the round. I recommend using a stitch marker at the beginning or end of each round. Slowly stuff as you go, you want it to be firm but not stretched.Pattern Stitches Used:If you intend to make this sweet seal pup for a little one under 3 I recommend making crochet eyes instead of the plastic safety eyes. You can find my tutorial here.If you are new to amigurumi be sure to check out my tips to learning amigurumi page. Along with helpful photo tutorials, it will cover basic amigurumi techniques that will help with this pattern. Fasten off leaving a long tail for sewing, with black yarn pass through 4 stitches 3-4 times as pictured to form the nose. Create a magic circle with 6 SC, pull tight and fasten off leaving a long tail for sewing. Fasten off (when you finish the 2nd tail do not fasten off, proceed to round 9). *Round 9 joins the tail together and starts the body. Round 9: Attach to the first tail piece with a SC. SC around the first tail and then the second (24 SC) This completes your join and is where your next round will start, from here we will work the body. NOTE: Here is where we will attach the facial features. Place the safety eyes 7 stitches apart between rounds 38-39. (If you are adding eyelashes, I recommend sewing them on before securing your safety eyes). Sew the mouth piece centered between the eyes and the cheeks on either side. At the end of round 13 pinch the flipper flat and make 6 SC across the top to close, fasten off and leave a long tail to sew onto the body. I know you’re going to love making this amigurumi seal pup and I so look forward to seeing your finished product. I’m excited to introduce you to Stephanie, the designer behind the blog Grace and Yarn! She’s made this her home for creativity, inspiration and joy! A place to share her passion and love for amigurumi with others! Having three young girls, she has had fun testing durability in materials and technique to help ensure your beautiful creations last. Aside from amigurumi, she also loves to make scarves, hats and home decor! When she’s not crocheting you can find her gardening, baking with her littles or camping in the craft aisles at Hobby Lobby.